Welcome to NYC Bullion: 10 Years of Experience! When it comes to selling diamonds or diamond jewelry, particularly diamond earrings, finding a trustworthy diamond buyer and grader is critical. As the prices for diamonds have increased over the last few years, more diamond shops have been established. But one thing that you should keep in mind if you are looking for where to sell diamond earrings is that only a few of them are qualified to grade your diamonds accurately and give you a fair offer for your diamond earrings. With NYCBullion, you can be 100% confident that you will get a certified top-notch assessment from our professional team of jewelry experts. When you decide to sell diamond earrings, you must remember that your offer is based not just on the resale value, but also on the designer/brand, size, clarity, and color of the diamond. Each piece is thoroughly assessed by our jewelers, to authenticate the real value and grading of your diamond earrings. Visit us in the Diamond District Area, in NYC, and get your free appraisal and a fair quote for your precious diamond earrings! 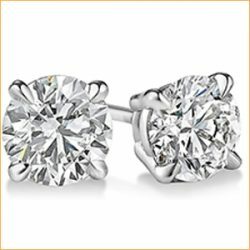 Where to Sell Diamond Earrings? Today it is very hard to find a place to sell diamond earrings and get a convenient and pleasant experience, without high-pressure selling. Luckily, NYC Bullion ensures you the best appraisal of your diamond earrings in NYC! Our high-class team of certified jewelers will provide you with a transparent assessment for each characteristic of your diamond earring. From identifying your jewelry brand to its resale value, every earring is examined to determine the size of the diamond, its clarity and color grade. We will offer you the fairest exclusive cash for diamond offer, to be sure that you will leave our store being completely satisfied with our payout and experience. Visit NYCBullion in the NYC Diamond District area and get any necessary details about how to sell a diamond earring, ensuring an accurate grading and value association. How to Sell Diamond Earrings? If you are still looking for the best way to sell your diamond earrings, you have found the right diamond buyer! Here, at NYC Bullion, we offer you a simple, secure and transparent experience when selling diamond earrings both in-store and online. You can be completely confident that your diamond earrings are graded by a reputable buyer and assessor. Simply visit our store and let our qualified jeweler team handle the complicated process of diamond authentication. They will evaluate your diamond earrings right in front of you, so you can be sure that you’ll receive all the necessary explanations and guidance about your diamond earring’s color, size, and clarity, as well as designer and resale value. Or, if you prefer to receive your quote online, just complete the “Get an offer now” form to get your cash for diamond earrings offer today! NYC Bullion is located in New York City’s Diamond District. We are your one-stop bullion buying shop. What is the difference between silver and sterling silver?